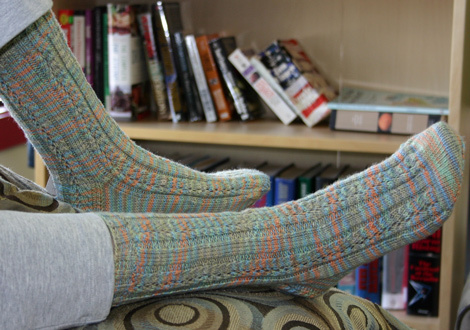 The sinuous beaded cables and lace of the Waterlily Socks evoke romantic, lazy summer afternoons. The beading technique is easy, just let pre-strung beads rest between stitches. 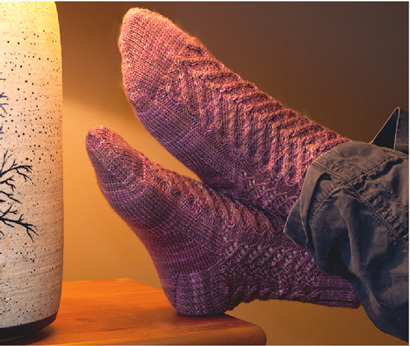 Materials required to make this pattern include: 370 yards of sock yarn, US #1 needles double pointed or you may choose 2 sets of circular needles as the pattern is written, 112 Size 8 seed beads, cable needle, stitch markers, tapestry needle, big eye threading needle. Gauge: 34 sts over 4 inches in stockinette stitch.